Google's already famous home "doodle" is celebrating the 30th birthday of PAC-MAN, by letting you actually play the game on its home page. There's casual Friday, and then there's Get Nothing Done Friday. Thanks to Google, we're getting deeper into the latter by the minute. 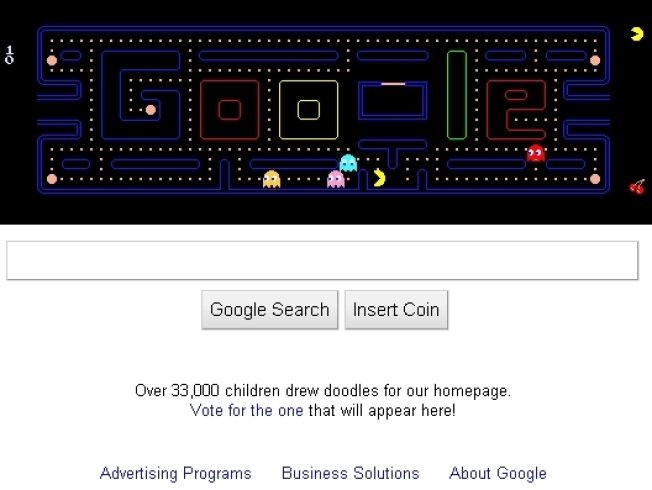 Google's already famous home "doodle" is celebrating the 30th birthday of PAC-MAN, by letting you actually play the game on its home page. "Insert Coin" is one of the click choices on the front page, and it launches a moving, noise-making, very cool rendition of the game we all wasted hours, days, and weeks on as kids. The actual birthday is Saturday, May 22. It was 30 years ago, Japanese company Namco launched PAC-MAN, which not only spawned sequels like Mrs. PAC-MAN, but really helped launched the video game revolution as we know it. There he was, running around in your nearby arcade, then on the Atari 2600, and now on your iPhone and iPod tough. Oh, and of course on your computer, thanks to the Google start page. That page is pulling in all sorts of traffic today. It's the top trending topic on Twitter, it's all over Facebook, and almost anywhere else you look online today. And isn't that cool -- a 30-year-old videogame becoming the talk of cyberspace, typically the home of all that's new, hot, and super-hip. Now, thanks to Google, and a game approaching middle-age, chasing retro ghosts is once again all the rage.